We got what seemed like a ton of potatoes from our CSA when they shut down for the rest of the season. We love potatoes, but there really are a lot of them, so I decided to get creative – there are only just so many mashed potatoes we can be expected to eat. I decided to make potato skins. I don’t know what made me think of it since I haven’t had those in about 20 years, but it sounded good. 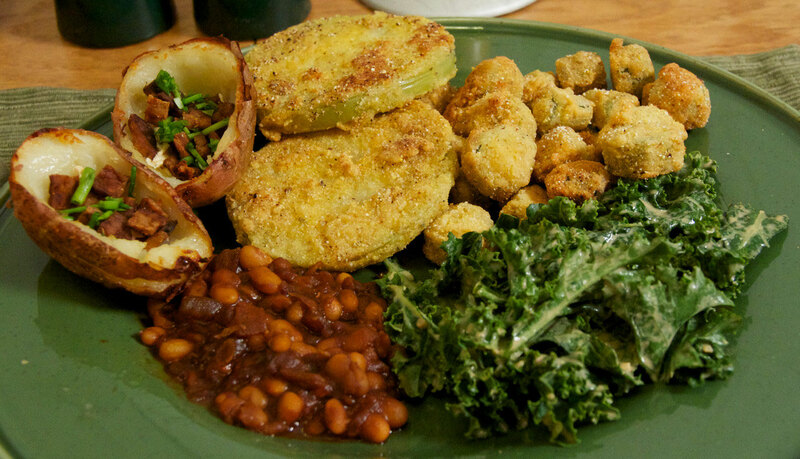 We were expecting green tomatoes from the CSA, so I decided a plate full of junk food was in order: fried green tomatoes, fried okra, potato skins. Since I felt like there should be something healthy on the plate, I went with kale and baked beans. So, first things first – potato skins. We got red and purple potatoes, which are not usually the kind you’d use for making these, but it was what I had, so I used a couple of the red ones. I didn’t use a recipe I just baked them & scooped out the insides. I did look up how long to cook them once they go back in the oven and I’m glad I did because I learned that you’re supposed to coat them in (vegan) butter or oil and broil them before you fill them. Instead of cheddar, I decided to go with Daiya pepperjack, which was delicious. I also filled them with Fakin’ Bacon and when they came out of the oven, sprinkled chives on them. Super yummy. Now I want to experiment with more fillings and different cheeses. I had to go to the farmer’s market to get the okra for Seth (I hate okra – slimy little bastards), and I thought I’d get a green tomato there too, but no one had any, so I had to get it at the grocery store. Oh well. Again, no recipe here, jut some improv. A lot of Southern cooks use buttermilk for the liquid when making these, so I made a little of my own with soymilk and cider vinegar. I added a little flour to it to thicken it up and make it sort of like a batter. For the coating, I mixed cornmeal, flour, garlic salt & Cajun seasoning. An easy trick for making the okra – put your cornmeal/flour mix in a container with a lid and just shake up the okra to get it all coated quickly. In the South, we will fry anything and then dip it in ranch dressing, so I had to make a batch of that too. I love the recipe in Cookin’ Crunk; it’s delish and easy to make. I like to add a little Dijon and a squirt of agave to it. Super yum. OK – so, potato skins smothered in butter and processed food –check; fried stuff – check; ranch dressing – check. Now for the healthy stuff. The Whole Foods near us has this amazing kale in garlicky dressing – I could eat my weight of that stuff. I found a recipe a while ago for a really similar dressing. This one comes out a little too salty as written, so I reduce the amount of tamari. It’s best of you massage it into the kale and let it sit for a few hours. We love the Happy Herbivore baked beans recipe, so that’s our go-to. I use dry beans that have been soaked and cooked, but canned are what is called for in the recipe. They came out really good this time. Once I got everything on the plates, I realized that I’d made way too much food. There were a couple of potato skins and a slice or two of fried tomato left over. There are always beans left, so this will make a nice little lunch for one of us this weekend. Next time someone tells you vegans are all health nuts, show them the picture of this dinner. So much fried.